Over the past few months I have been trying some Korean cuisine. One thing that keeps coming up in my exploration of Korean cuisine is kimchi. Kimchi is fermented raw vegetables. 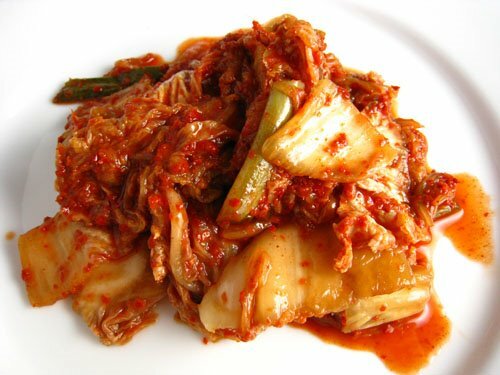 One of the most common forms of kimchi is made with cabbage and chili. Up until now I have been buying my kimchi in little jars from the store but it was a bit expensive. I have seen several posts about how to make your own kimchi that sounded pretty easy. I decided to try making my own kimchi. Making kimchi requires fish sauce which you should be able to find in the Asian section of your local grocery store. Kimchi also requires gochugaru which is Korean chili flakes. You should be able to find big bags of the gochugaru at your local Asian grocery store. Gochugaru is not quite as hot as red pepper flakes and is a little sweet and all round very good. It is used in many Korean dishes. Cut the napa cabbage in half, remove the core and slice the cabbage into 1 inch wide strips. Place a layer of cabbage into a large bowl and sprinkle some salt onto the cabbage. Repeat until all of the cabbage is in the bowl and salted. Let the cabbage sit in the salt for a few hours. Rinse the salt from the cabbage. Mix the cabbage, green onions, garlic, ginger, gochugaru and fish sauce in the large bowl. Place the cabbage mixture into a sealable container leaves a couple of inches at the top. Seal the container and let ferment at room temperature for 2-3 days. Place the container in the fridge and let ferment for a couple more days. Take a look at the Weekend Herb Blogging roundup at Kochtopf. That looks like the real thing. Well done! I love Korean food, kimchi with Korean BBQ, bibimbap and a chilled beer- I’m in heaven! Yes I’m low maintenance like that. Haha. Man, I love cabbage and I love kimchi, but I’ve never thought about making it myself. Thanks for the recipe and inspiration! how cool that you made your own kimchi! Hey, your kimchi turned out great! Thanks for the link. Much appreciated. See, it is easy! You can ferment all kinds of things like this. If you can find the baby korean daikon, they make a kimchi out of that that is dynamite. Sounds very interesting… in Polish cuisine we make sour cabbage and soured cucumbers… (my favourite after 3-4 days, when they half way ready and still crunchy). They have a saying in Korea (my friend told me this): If you can make good kimchi, you can be a good wife too! Kudos to you! It would never occur to me to make my own, though I love eating it! I’m almost embarrassed to tell you that I’ve tagged you. You can visit my blog to check out the “rules”. One of the few foods that I refuse to eat. I am impressed that you made your own though. It does look like the real McCoy…job well done and I do like me a side of kimchee. Wow, I’m so impressed!! Anthony Bourdain was talking about Kimchi on one of his No Reservations shows. Sounds like it was a great accomplishment! you could serve me a bowl of that with some of your french bread I’d be happy. very cool.. I wanna try now! thanks for sharing. I love homemade kimchi! But I get it like every 2-3 years 🙁 Knowing that it’s that easy, I must try for myself! It looks so yummy! You’re right it looks so easy to make. I never experimented with kimchi before. That look so authentic, great job Kevin. I love kimchi, so thanks for the recipe. I discovered “Koren Town” in a part of the city by accident, and I crave for the bulgogi often. Wow…this looks really great and sounds interesting too. Love this post. The picture is great–and I’ve thought of making my own kimchi, so this was very interesting to me. Such a great, informative post! Your kimchi looks and sounds amazing… I’m so glad to learn about the Korean chili flakes, too! My wife makes kimchi in the recreatiion area of our retirement village because I will NOT allow her to make or store it in our unit. The stench is too powerful. We do love her homemade kimchi, however, particularly her summertime mul (mool?) kimchi that she makes super hot and spicy. Wow, very impressive. I’ve eaten Kimchi, but only from a jar. I do like it though I haven’t heard of this type of Asian chili flakes, but they sound like something I would love. Is it anything like Aleppo pepper do you know? I can taste that pickled heat from here! Love kimchi, but have never made it myself. Very well done, Kevin! wow… you made your own kimchi!! That’s nice. I should really try this once! We cleared out the NCO club one night by opening a fresh, homemade crock of that stuff when we were int he military. I have not had Aleppo pepper so I am not sure if it is similar. I will have to look for some to try. Wow, are you sure you’re not Korean? That kimchi looks awesome! I learned to make kimchi from my friend from Pusan. I used to make it regularly when kimchi was hard to find, but living in Hawaii now I’ve gotten lazy. This post reminds me that homemade is always the best! BTW, Aleppo is kind of like Korean peppers, sweet and hot, but is so much more pricey I can’t imagine using it to make kimchi. You might substitute the other way around though. Great post! kimchi looks fabulous! I just posted my ultimate kimchi recipe and cannot wait to try it again. What else can we kimchi? mustard leaves, kohlrabi? I love Kimchi too, its very refreshing, unfortunately the Kimchi in England is abit hit and miss… I think each time I have tried to make it I haven’t waited long enough, the temptation is too much! What is the longest you have left it for? Kumiko: Kimchi seems to keep really well in the fridge and I have had batches in the fridge for months. Great! I love kimchi. I only have to find that Korean chilli flakes. Thanks and congrats for your dishes! anyway, i love that you reviewed your world view and took command of your kitchen and your mouth (eating, i mean). i have a chinese dragon pot for quick pickles, but it’s been years since it was more than garniture. you’ve inspired me; look out organic grocer: I need rice bran and veggies! BTW, re: Cindy’s comment about good kimchee = good wives. in Japan, there’s a little twist. don’t be too effusive when complimenting the farmhousewife on her pickles: you’re suggesting she’s great in bed! Kevin, I tried this recipe and it’s awesome! I’m so excited to be able to say that I have made kimchi. Thank you SO MUCH! I’ve been living in Korea, in Seoul for the past 6 months. I find the scent of kimchi rudely all pervasive, truly the among the most disgusting odors I’ve ever experienced. Why would anyone in their right and educated mind decide to eat something — no matter how “healthful” it may be considered– only to have the stench ooze out of the pores? There are plenty of other beneficial foods that do not exact such an odor. By the wary, it’s not the only Korean “smelly” food. I stumbled on this blog after looking to see whether Aleppo pepper can be used as a substitute for Korean pepper flakes for making Kimchi. I can find Aleppo pepper flakes easily for around $8.99/lb (which is VERY reasonable IMO) and I used it to start my very first batch of kimchi yesterday. I'm no expert on kimchi, and I haven't yet found the Korean pepper flakes, but I LOVE Aleppo pepper and I hope it turns out great. So I am from Korea and have been trying to make good Kimchi…. So your picture looks so good. It's impressive! I really enjoy most of your posts, but being a vegetarian (no seafood, meat, chicken), I was wondering what to sub for the fish sauce for your kimchi recipe… Can you help? Perfect Witch: The fish sauce is there primarily to help kick start he fermentation process but it will still ferment without it. Soy sauce is another salty fermented sauce and I have seen a few kimchi recipes that call for it instead of fish sauce. i was wondering, instead of using red chili flakes if i could use red pepper powder to replace it instead. does it change the taste or anything? Anonymous: I would make the effort to find the Korean chili pepper flakes or powder as it has a distinct flavour. Love your blog. You are amazing how much cooking you're doing and fab photos. I wish I saw your recipe before soaking my cabbage in salt water. I was also squeezing out the water after soaking, this saves 2 steps, hooray. I like mine crunchy, not fermented and sour, so I try to eat it as fast as I can! Thnx for tips, will try w/out water next time. Happy New Year. Thanks for the recipe. Can you recommend a storage device – all glass? Ceramic? Plastic? What did you use? Pamela: I normally just use large plastic resealable containers such as the ziplock or glad containers with lids. Glass containers would probably be better at containing the aroma but I do not have much of a problem with that with the plastic. Thanks, Kevin. I'm working on my shopping list…..! I made this recipe and it turned out GREAT. Thank you so much. At the end of my jar, I had quite a bit more sauce than cabbage left. (I made fried rice with it, though, which turned out great.) So, next time I'll pick a slightly bigger cabbage. How big of a cabbage do you use? It might be helpful to specify the weight of the cabbage in the recipe. Thanks again! eli: I am glad that you enjoyed the kimchi! I normally grab the biggest cabbage that I can and it usually easily fills an 8 cup container. I will have to check the weight when I make my next batch. Another great way to enjoy the leftover juices is in some Kimchi Jjigae (Pork and Kimchi Stew). oh, my god! I am so thrilled to find your recipe to make Kimchi! I am a Korean, and even my mom did not try to make Kimchi anymore!! !your Kimchi look so good!!! I am very very impressed. I used this today as a base for my first kimchi… I hope mine turns out as delicious as yours! Is it okay to store this in plastic while it's fermenting? erisgrrrl: Plastic is ok! Let me know how your kimchi turns out. Kevin, I've made your recipe twice now, and while it's good, it never quite measures up to the several kinds I can get at my local Asian store. My first problem is I add too much pepper for the amount of cabbage I have – but that's easily fixed. What I want to keep adding, though, is a little bit of sweet, and some vinegar. Could it be that my batch isn't fermenting? I'd appreciate your input. From all your recipes, it looks like you appreciate kimchi as much as I do! Pamela: For this kimchi recipe I went with a very basic cabbage only kimchi. A lot of cabbage kimchi that you can buy also has daikon radish in it that is thinly sliced. It would add the bite that you are looking for from the vinegar that you suggested. Though most traditional recipes that I have seen do not include a sweetener, I have seen some recipes that include a tablespoon or so of sugar for a touch of sweetness. I also find that the quality of the kimchi is highly dependent on the gochugaru. The last brand that I got is not producing nearly as good a kimchi as the first one that I got. I will definitely have to go back to the first brand! Thanks for the ideas, Kevin! Will try adding daikon next time. The pepper I'm using is mostly in Korean of course, but two English phrases are "Assi Brand" and "imported by Rhee Bros., Inc." Is that familiar to you? By the way, I was at my favorite local Korean restaurant (Arirang in Ann Arbor) the other day, and one of the little dishes was garlic scapes in some sort of gochujang sauce. Absolutely wonderful! Pamela: I transferred the pepper to containers… I will have to check the next time that I pick some up. Garlic scapes with gochujang sounds good! I am going on a fermenting course tomorrow strangely enough. This looks so good. Very well written. Thanks Kevin, you are inspiring. I've seen some recipes that say the cabbage must be completely submerged in brine and all of the air bubbles removed, and that it should be weighted down. You don't seem to specify that in yours. Is that what I should be doing, or is it ok for there to be a bit of brine at the bottom but air around the leaves? Jonathan: By brine, I am guessing that you mean the kimchi juices? In the first stage you salt the cabbage to help remove some of the excess moisture and then rinse the salt off completely. Then you mix everything up and let it ferment. When you first place the kimchi in the container for fermenting there will be air in the kimchi but as the kimchi ferments the cabbage will release more liquid which should push most if not all of the air out from in between the cabbage. The top of the kimchi may still be exposed to the air and if you leave it in the fridge for months at a time without touching it the kimchi that is exposed to the air may start to go bad just like anything else. (You can simply skim that layer off and the kimchi underneath will still be good.) Normally though you would be using the kimchi on a more regular basis and this would never happen. I noticed that you found one brand of gochujang produced better results than another, what brand would you recommend? Dilek: I don't really have that great a selection of gochujang and I have not had the chance to test too many different ones so I cannot offer you much in the way of advise on which brand to get. I can't find the korean chilli and ended up using regular chilli powder but my kimchi is kinda brownish and not red – is that normal? Jess: The Korean chili pepper flakes are what gives kimchi that bright red colour. What kind of Chili powder did you use? I used regular ground chilli powder. It is also extremely pungent which I assume it should be fermenting alright. I'll try again if I can find the korean chilli powder. Thanks for the recipe! Jess: There are a lot of different chili powders. A cayenne chili powder would probably give it a nice shade of red where as a chipotle or ancho chili powder would make it more of a brownish colour. The Korean chili powder really gives it that distinctive flavour though. If you cannot find it locally there are a few online shops in the US where you can order it from. If there is a Korean restaurant in your area that makes their own kimchi, you could ask them where they get their from or if they would sell you some. Sam: I have never tried making it with powdered gochugaru but I normally use that much of the flaked gochugaru. It is possible that the powdered version is hotter and that you might need to use less of it. I'm a vegetarian so I was wondering do I need to use fish oil/sauce? Rafidah Mohammad: You can use soy sauce instead of the fish sauce.